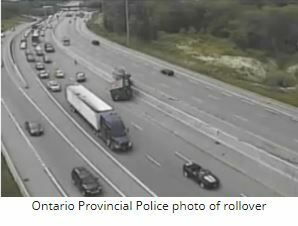 A June 12th traffic accident on the QEW Highway through St. Catharines, Ontario involving a tanker truck carrying phosphine resulted in a hazmat response and an order by police requiring the evacuation of all persons within a 2-km radius of the incident. No one was seriously injured in the accident and no phosphine, a toxic and highly flammable gas, was released. The QEW Highway links the City of Toronto with Niagara Falls and runs through a City of St. Catharines, a community of 133,000 people. The hazmat incident began when the truck carrying phosphine flipped over on the highway. A fire broke out as a result of the rollover and it was not immediately evident if the product in the tanker’s trailer had leaked. 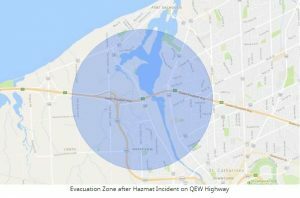 As a precaution, Ontario Provincial Police coordinating with hazmat crews from the City of St. Catharines ordered closed the highway and ordered the evacuation of all persons within a 2-km radius of the incident. Phosphine, the chemical on the tanker truck that was involved in the incident, has a DOT hazard label of 4 (health – can be lethal), 4 (flammability – burns readily) and 2 (instability – readily undergoes violent chemical changes at elevated temperatures and pressures). It is colorless gas with a disagreeable odor of fish or garlic. 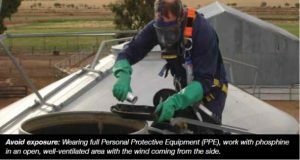 It is very toxic by inhalation at extremely low concentrations. After the initial incident, a hazardous goods cleanup crew from the City of Hamilton (approximately a 30-minute drive from away) later determined “the phosphine is contained and there is no leak,” Niagara Police Const. Phil Gavin told CP24, a local media outlet. The initial evacuation order by police was set at 1.2 kilometres (1-mile) and then increased to a two-kilometre radius to reduce the public’s risk of exposure to the phosphine gas. “We train for this type of this thing, all of the agencies train for this type of event, and we were prepared to come to the community’s needs and their help,” said St. Catharines fire Chief Dave Wood during a media event Wednesday morning. He said everyday there are hazardous materials and chemicals carried up and down the highways but noted legislation is strict regarding how it must be contained and what type of containers it can be shipped in.